After an indecently large hit of Clementine and Witches Weed joint, it began. Giggling and energy through the roof, BAM. The munchies strike! Who else gets the munchies after smoking or dabbing? Most people do!!! Cannabis affects people vastly differently, in part, because the endocannabinoid system regulates homeostasis that incorporates cannabinoids into the body. Homeostasis basically keeps the body in balance. So, one person could get hungry and another might not want to eat at all. Other studies have noted cannabis can increase people’s metabolism, perhaps because if the metabolism is slow, cannabinoids support the body towards balance. 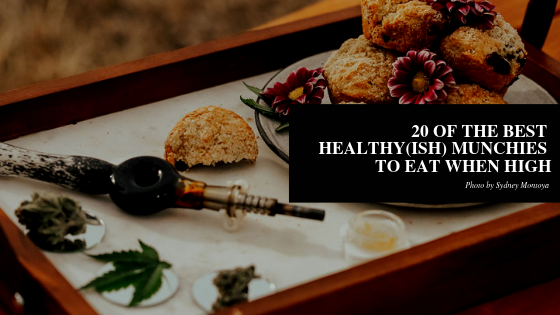 Even better, there is some evidence to suggest the foods you eat when high can enhance and heighten the experience, while others can modulate it if that diamond was a little too much to function comfortably. I interviewed our entire team and hemp temps to find our the absolute best munchies to eat when elevated. Thus, may the munchies lead you into properly fueling your body!!! There is evidence to suggest certain foods can enhance the sense of elevation when combined with cannabis consumption. Chocolate actually mimics the effects of cannabinoids, which explains why chocolate makes people feel so excellent. Also, saturated fats are known for best-assimilating cannabis compounds so cheers to brisket tacos and avo toast slathered in butter. In any case, these foods taste AMAZING so enjoy regardless! Chocolate… anything. Chocolate drizzle with fresh coconut. Chocolate date brownies. Chocolate for days. Since chocolate mimics the effects of cannabinoids, it’s an A1 choice. Tacos for days. Because beef contains saturated fats, it helps assimilate cannabinoids. If you’re already elevated, infused chocolates will definitely get you higher. Honestly. We’d make mango salsa this way in our rosin press if we could. But here’s a excellent recipe for Mango Salsa since we can’t. In case you’re noticing a trend, we are recommending a mango smoothie in this case! You can add a THC tincture for an extra kick as well. Slather some butter on bread, add avocado, and let those good fats ride you to ride you to the next level. If you’re needing an even more extra boost, make it infused butter. Buy em’ in bulk at Sprouts or Whole Foods Market. But try not to do it WHILE you’re lifted or you could spend all the money on mango slices. Happens to most! Just keep your CBD oils, tinctures, and dabs on speed dial. Slap and shake together 1 part olive oil to 1 part hemp oil and drizzle that baby over cheese and tomatoes. Cooling and soothing, it’ll help you slow your roll. So creamy, so dreamy. One of our homies Grant recommends Sacred Body CBD’s. Drizzle melted chocolate over some popcorn and toss some CBD Cinnamon and Honey over that bad boy. You’ll get lost in the symphony of crunch. There are some people who say orange juice helps. In any case, might as well make it frozen to help with the blazing desert that is cottonmouth. You can honestly take these babies either way. Infuse coconut oil or butter with CBD flower like Pure Love, or high THC GSC. Dealer’s choice! Would this really be a list of munchies without CBD dark chocolate? No. Do keep in mind edibles are not the fastest method for coming down. I absolutely love Gataka Wellness’s 240 mg CBD chocolate. I picked it up at Lucky’s Market in Boulder, or occasionally at Wonder Press. We’re not here to judge! Here are snacks to just enjoy en mass with minimal guilt. Pop on the office and grab a bulk bag of mixed nuts and have yourself a good time. This came up a lot for the crew, Greg and Stephy especially. Perhaps it’s the magical variety of sweet and salty, of nuts and fruit, or perhaps when you’re really lifted it become its own microcosm of a symphony of flavor. Look we said, “Healthy-ish”, okay? Pizza. By demand of the entire crew save the dairy-free fam. Plus, you can make it healthy-ish like in this recipe, right? So load up OG Kush Diamonds and on the Za. Can you image rows and rows of sushi after medicating on a big rip of Clementine flower? Is there anything more blissful than that?! For more easily attained deliciousness you can always grab seaweed snacks. You are gauc, baby. Don’t let anyone tell you you’re salsa. And so you should enjoy the smooth and creamy delight that is chips and guacamole whilst medicated and elevated. Just, the entire bag. Cuties, for those not inclined to waste time trying to pry open an orange. Slather some tahini on their for some extra calories! Honestly, my favorite “zone out and watch Netflix” munchy. There is just something about a giant bowl of salad that does it for me. It uses my elevated state of being to load up on antioxidants and vitamins. My favorite is the Taylor Farms Asian Chopped kit because you pretty much just cut it open and throw it in a bowl! Big thank you to the crew and our Hemp Temps, especially Grant and Rich, for all their answers! If you’re a little too elevated, here’s our favorite Colorado CBD based products to keep in your medicine cabinet at all times! Contributors: Greg Meyer, Jordan Stauder, Kelly Snyder, Stephanie Owens, Mel Craige, Aaron Saperstein, Grant Monroe, Ganja Boy Rich, Sydney Montoya Photography & Karli Adams Photography. Written by Kimzy Nanney, Certified Holistic Health Coach turned Marketing Director for Rocky Mountain Green.